Hotel Super 8 by Wyndham Tomah Wisconsin, Tomah, United States of America - Lowest Rate Guaranteed! 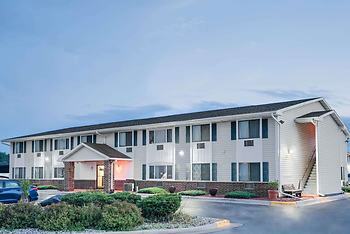 Located in Tomah, Super 8 by Wyndham Tomah Wisconsin is a 5-minute drive from Hiawatha Golf Club and 7 minutes from Butts Park. This hotel is 3.6 mi (5.7 km) from Area Community Theatre and 9 mi (14.4 km) from Cranberry Discovery Center. Sparta was full so I had to stay in Tomah. Enjoyed my stay, everything was centered around the super 8. I liked that I was given a handicapped room as I requested. The walk-in shower was great. The room was clean and everything worked. It was quiet and easy to find. It was older, but I was tired and just needed a bed and a place to clean up an relax. Clean and quiet. Staff very helpful. Needs a little updating on their stairs and hallways. The Customer Service was amazing!. There was a very friendly atmosphere.